This past weekend, Troop 50 Scouts and leaders donned their backpacks loaded down with all the water, food, and camping and personal supplies they would need for two days and one night on the trails of Providence Canyon State Park in Lumpkin, Ga. The park, known as Georgia’s “Little Grand Canyon,” is a testament to the power of man’s influence on the land. Massive gullies as deep as 150 feet were caused simply by poor farming practices during the 1800s, yet today they make some of the prettiest photographs within the state and easily mistakable for Arizona landscapes. The canyon soil’s pink, orange, red and purple hues make a beautiful natural painting at this quiet park. Assistant Scoutmasters Wes Williams and Bryan Herrit. As with most troop outings, the troop divided into patrols, with each member of the patrol tasked with carrying essential pieces of the patrol's cooking and camping gear, food, and water in addition to each Scout's own personal gear. Because of the time of year, the ability to acquire enough water to filter and drink from the state park's creeks was nonexistent, meaning Scouts were encouraged to carry at least four liters of water for their personal needs in addition to the water required for patrol cooking and cleaning. and Michael Tullier, and Committee Member Christian Dagg. So the patrols could backpack and camp independently, the Carnivorous Pandas set out first, followed later by the Outdoorsmen. Each patrol set out from the park's visitors' center and traveled east on the three-mile White Blaze Trail before meeting up again at the visitors' center for lunch. 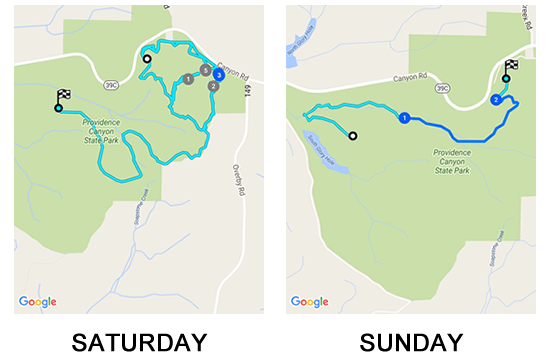 After filling their stomachs, patrol members topped off their water supplies and set out separately again — this time on the seven-mile Red Blaze Trail. Both trails offered scenic views from the canyon's base and its various ridges. The troop also traveled past an abandoned homestead that predated the state park, saw two Eagle Scout service projects, and trudged up several steep hills before arriving at their campsites. The Carnivorous Pandas took refuge in the park's Campsite 4, and the Outdoorsmen found respite in Campsite 6. Outdoorsmen Patrol members pitch their tents. Each patrol went about setting up their campsites, pitching their tents, and readying for dinner. After the widely popular cooking demonstration led by assistant scoutmasters Clyde Wikle and Bryan Herrit the Monday before the campout that featured Mr. Wikle's pasta alfredo recipe, each patrol decided to replicate that meal on the trail. By the time the sun went down and everyone's bellies were full, members of both patrols turned in early to give their sore muscles and feet a chance to rest. complete the final leg of the troop's backpacking trip. Both patrols were up with the sun on Sunday, and after an instant breakfast that included either oatmeal or grits and the standard campout staple of pop-tarts, the Carnivorous Pandas traveled to the Outdoorsmen's campsite for a troop-wide "duty to God" devotional service. Assistant Scoutmaster Michael Tullier shared with the troop the story of Vietnam fighter pilot and POW Charlie Plumb. Captain Plumb shares his story of how he met the fellow Navy serviceman who packed the parachute he used to survive being ejecting from his jet when it was shot down over Hanoi. The troop discussed the special people in each of our lives who "pack our parachutes" every day by sharing their leadership, knowledge, and faith with us. On the last leg of the backpacking trip, the troop added 2.2 miles to the six miles it covered on Saturday, giving Scouts a total of at least 8.2 miles for the trip. While on the trail, the troop reached a maximum elevation of 534 feet. with lighting a backpacking stove. At the troop's Patrol Leaders' Council meeting the Monday following the campout, youth and adult leaders critiqued the pros and cons of the weekend outing. The PLC praised the troop's collectively teamwork and the backpacking performance of the troop's first-timer backpackers. Adult leaders complimented those Scouts who led meeting programs on backpacking preparedness and packing prior to the campout, which contributed to helping our newer Scouts ready for the trip. Scouts noted the good food and the good experience everyone got with trail cooking, as well as the steady pacing while on the trail. Adult leaders recommended the PLC consider how to improve the use of the buddy system, especially as patrol members looked to break off and make impromptu side trips while on the trail. Everyone also recognized how better use of duty rosters and patrol assignments would ensure everyone has something to do and tasks like cooking go efficiently. The troop's next outing will be in November when Scouts and leaders travel to Mobile, Ala., to explore and spend an evening on the USS Alabama. For more pictures from the Providence Canyon backpacking trip, visit the troop's online photo album.